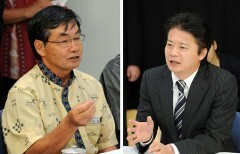 In the morning of October 19, at Nago City Hall, Foreign Minister Koichiro Genba (right) seeks understanding of the relocation plan to Henoko and Nago Mayor Susumu Inamine responds by requesting that the foreign minister cancel the Japan-U.S. agreement on Futenma. On October 19, Foreign Minister Koichiro Genba met with Nago Mayor Susumu Inamine at Nago City Hall, and with Okinawa Governor Hirokazu Nakaima at the Okinawa Prefectural Office. He requested their understanding with regard to the plan to relocate the Futenma Air Station to Henoko, Nago City, which was decided upon by the governments of the United States and Japan. 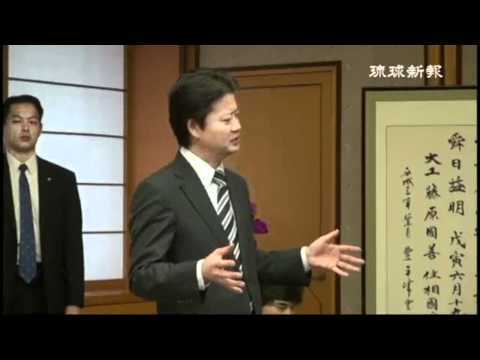 However, the mayor responded by expressing his objection to the Henoko plan and strongly requested that both governments cancel the agreement regarding Henoko. Governor Nakaima reiterated his stance, saying, “[Getting acceptance of] moving the U.S. Marine Corps from Futenma Air Station to Henoko will take a long time. We want it moved somewhere else in Japan and want Futenma Air Station returned to Okinawa without further delay.” The central government is yet to bridge the rift between Tokyo and Okinawa. In the afternoon of October 19, at the Okinawa Prefectural Office Okinawa, Governor Hirokazu Nakaima asks the foreign minister to relocate Futenma Air Station outside of the prefecture. At the meeting with Governor Nakaima, the Foreign Minister issued an apology, saying, “[With regard to the Futenma relocation] Our talk of relocation to somewhere ‘at least outside the prefecture,’ increased the level expectation, and unfortunately, we have ended up coming back to the Henoko plan.” He went on to say, “Considering the role of Okinawa in East Asia, finding an alternative somewhere else is no easy matter. It’s painful for me to have to say this, but I would like to ask you to accept the relocation of the facilities at Futenma within the prefecture. This is the starting point for us to remove the risks that currently surround Futenma. We want to move ahead with this plan in keeping with the U.S.- Japan agreement to promote the relocation of the Marine Corps in Okinawa to Guam and to return the land used by U.S. bases south of Kadena.” With this Genba indicated his intention to push ahead with the relocation to Henoko. 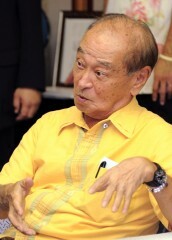 At his meeting with Nago Mayor Inamine, the foreign minister said, “[With regard to the relocation of Futenma outside the prefecture] I would like you to understand that we have tried hard to come up with a way to resolve this issue,” but the mayor responded by saying, “We do not sense that the government is trying hard to resolve this issue.” He continued by saying, “The candid opinion of the people of Okinawa is that we will not tolerate any further burden.” Inamine also explained his election promise that he “will not approve the construction of a new base in the sea or on the shore at Henoko,” and after clearly stating, “Right to the end, I am determined to keep the promise I made to the residents,” he urged the foreign minister to approach the United States to call off the plan to relocate the base to Henoko. On October 19, Foreign Minister Genba visited Futenma Air Station and Camp Schwab. On the same day, he also met with Takeshi Onaga, the mayor of Naha City, Takeshi Gibu, the mayor of Kin Town, and with various leaders of the municipalities around Kadena Air Base.